a photoelectric device that measures oxygen saturation of the blood by recording the amount of light transmitted or reflected by deoxygenated versus oxygenated hemoglobin. finger oximeter a pulse oximeter whose sensor is attached to a finger, so that the oxygenation of blood flowing through the finger can be determined. See illustration. Finger oximeter. Pulse oximetry transducer properly placed on a finger. Fold the Oxisensor over the end of the digit. Align the other end of the sensor so that the two alignment marks are directly opposite each other. Press the sensor into the skin. Wrap the adhesive flaps around the digit. Courtesy of Nellcor Puritan Bennett Corp., Pleasanton, CA. pulse oximeter an oximeter that permits measurement of oxygen saturation in an artery by recording the different modulations of a transmitted beam of light by reduced hemoglobin and oxyhemoglobin as seen during the pulse. A component of the oximeter analyzes the variations in light absorption and provides a readout of the per cent of saturation of the hemoglobin. A saturation above 90 per cent corresponds to a PaO2 of 60 torr or higher. The presence of fetal hemoglobin, carboxyhemoglobin, or intravascular dyes may alter the accuracy of a pulse oximeter. In these instances a SaO2 of 90 per cent may not be associated with a PaO2 of greater than 60 torr. 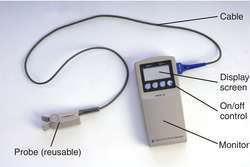 An instrument for determining photoelectrically the oxygen saturation of a sample of blood. /ox·im·e·ter/ (ok-sim´ĕ-ter) a photoelectric device for determining the oxygen saturation of the blood. A device for measuring the oxygen saturation of arterial blood, especially a pulse oximeter. a device used to measure oxyhemoglobin in arterial blood. See also pulse oximeter. A laboratory instrument capable of measuring the concentration of oxyhemoglobin, reduced hemoglobin, carboxyhemoglobin, and methemoglobin in a sample of blood. A device for measuring or monitoring the oxygenated fraction of the haemoglobin in the circulating blood. Oximeters use photoelectric methods to detect colour differences in blood of different oxygen saturation. They are valuable aids to safety and are widely used in operating theatres and in intensive care units. See also PULSE OXIMETER. a device for measuring oxygen concentration. Maximum concentrations of HBOC-201 that will not produce assay interference on the Chiron 865 cooximeter. provided the 912 COoximeter for this work, and Radiometer America provided technical instructions for access to the OSM3 service program. This is termed an "exactly determined" system  and has been implemented in the IL 482 COOximeter (Instrumentation Laboratory), the IL 282 (its predecessor), and the Radiometer OSM3 Hemoximeter[TM] (Radiometer, Copenhagen, Denmark).